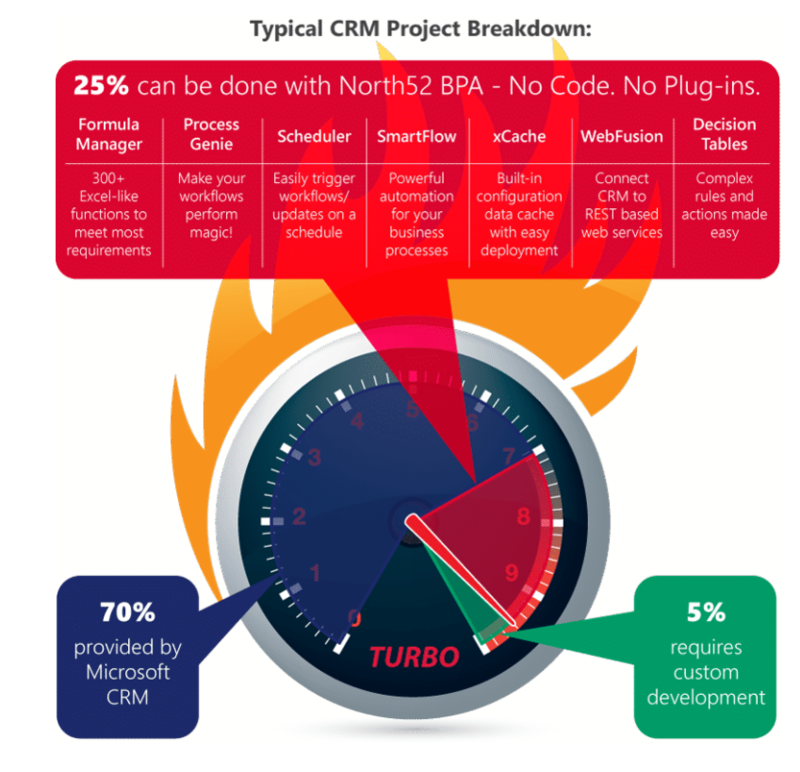 With North52 Business Process Activities (BPA) our goal is to help you embed your business processes into Microsoft Dynamics CRM by simplifying how you build your customizations. It significantly reduces your need for development expertise and speeds up implementation time by up to 10x – sometimes more! The ‘engine room’ of North52 BPA. Over 450 functions that can be combined to meet most of your customization requirements. The functions closely resemble those you find in Excel, therefore if you are familiar with Excel you should have no trouble using the North52 BPA functions. An intuitive tabular interface for modelling complex business rules. Decision Tables make it easy for you to create your rule conditions and actions via a point and click interface. Decision Tables are generally the default starting point for creating business rules within North52 BPA. Is a single custom workflow activity that can be used in Workflows, Dialogs and Action processes to execute a formula and optionally return a result back to the process. The Process Genie eliminates the need for installing your own or 3rd party custom workflow activity libraries as you can configure the required business logic for the workflow step in a North52 formula. If you have recurring processes, you can easily set up a schedule to execute on a regular interval. Use the Advanced Find and fetch XML to determine which records to process. The scheduler can scale to process hundreds of thousands or even millions of records. xCache is a configuration data repository which allows you to securely store reference data that can be used in your North52 BPA formulas. There are many attributes that can be specified on the cache records so that the cache records can be returned contextually in relation to time, business unit, CRM organization name, user settings and more. The cache is stored in memory for blazing fast performance. The SmartFlow function allows you to create complex multi-step formulas as one Business Process Activity. Variables can be set and used within the SmartFlow steps. Used for more complex business requirements that do not fit the Decision Table functionality. Building your business rules with North52 means that your maintenance time and costs will be significantly lower. It is much faster to make changes using North52 BPA than it is to make and deploy changes to custom code. A major benefit of North52 BPA is that your business rules will continue to work as Microsoft evolves the platform. North52 takes care of any changes to the platform meaning you do not have the worry or risk of having to refactor custom code.